A Flag Ceremony was today held in Afghanistan to mark the integration of the US and British Aviation forces within Helmand Province. 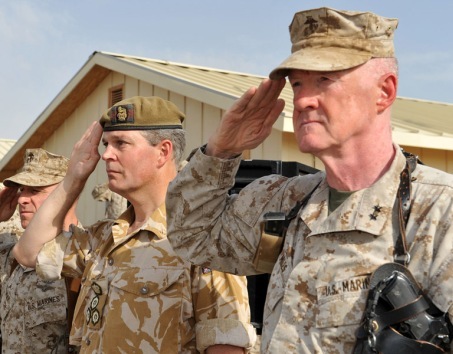 Major General Richard P. Mills, the Commander of the US 1st Marine Division and Group Captain Nick Laird, Commander of the Joint Aviation Group attended the ceremony designed to mark the start of the new tactical organisation. This is part of the larger reorganisation in Helmand Province, Afghanistan, which was announced by Major General Mills last week in which the area was divided into Regional Command South and South West with a rotating US / UK commander.